BOMA/GLA has voted to oppose Measure EE (LAUSD's Property Tax) which will be on the June 4th special-election ballot. Please join us in educating your networks about this damaging tax proposal. On Thursday, February 28, 2019, the Los Angeles Unified School District’s Board voted unanimously to place a 16 cents per square foot property tax on the June 4th special election ballot. The initiative (if approved by two-thirds of voters in LAUSD's service area) would raise approximately $500 million annually for LAUSD schools, mostly from businesses. We all want an effective public education system for our children and support greater funding to get there. Unfortunately, money from the tax won’t add resources to classrooms. It will be used to temporarily fix a budget deficit and to pay for LAUSD’s over-promised pension and health insurance costs. District bureaucrats and defenders of the failed status quo want taxpayers to bail out a school district with a history of red ink, appalling education results, declining enrollment, runaway administrative hiring, and exploding retirement and health care costs. BOMA/GLA has over 120 member buildings within LAUSD’s jurisdiction. This tax will collectively cost members tens of millions of dollars in additional taxes. This tax is regressive: The vast majority of the costs will be carried by tenants. As a result, small business tenants with narrow profit margins will be the most adversely impacted by this. Furthermore, this is a blanket 16 cent/square foot tax and does not factor in property value. Parcel taxes have become an increasingly common method to fund government projects and close budget deficits. This places an unfair burden onto commercial real estate owners and their tenants, many of whom do not directly benefit from the programs these taxes fund. This tax increases the base cost to rent a commercial space which could impact marketability. LAUSD rushed this process and did not meaningfully engage commercial real estate or the broader business community in advance of their decision. As a result, LAUSD opted for a 16 cent/square foot parcel tax that disproportionately impacts commercial property owners and their tenants rather than a flat parcel tax that would have mitigated the burden. LAUSD did not address its own inefficiencies prior to placing this tax on the ballot. It simultaneously made financial commitments beyond its means to resolve the teachers strike. Asking property owners to carry the burden of LAUSD’s decisions is unfair. Even worse this new property tax is coming on the heels of last November’s stormwater parcel tax (Measure W), and with a potential for other Los Angeles County parcel tax measures on upcoming ballots (one to fund the Fire Department and another to fund libraries) plus a Split Roll Property Tax (Proposition 13 “reform”) initiative that has already qualified for the November 2020 ballot. 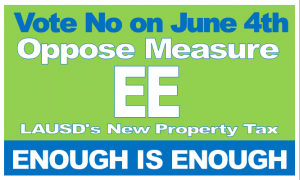 VOTE NO ON MEASURE EE - ENOUGH IS ENOUGH!